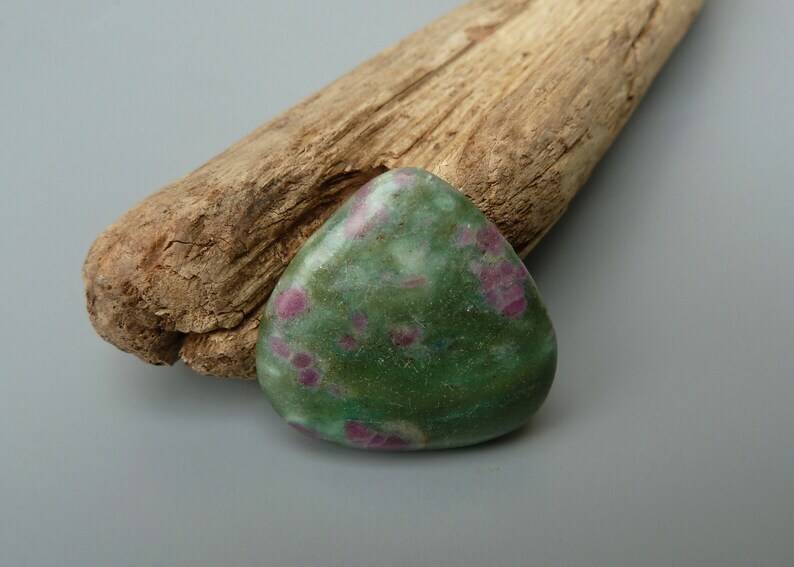 This listing is for one top drilled Ruby in Fuchsite pendant bead. Fuchsite is a green variety of muscovite mica containing chromium which is the source of fuchsite’s green color. Fuchsite was named after Johann Nepomuk von Fuchs (pronounced “fooks”) who was a German chemist and mineralogist. When bright red corundum crystals are present, the mineral is known as Ruby in Fuchsite. Ruby in Fuchsite is commonly confused with Ruby in Zoisite but the main difference is that the ruby is rimmed with blue kyanite in Ruby in Fuchsite but this does not occur in the Zoisite.